The Common Libraries initiative flows from the drivers of change in UK library services, moves to re-imagine libraries as spaces to facilitate science, technology, engineering, arts and mathematics (STEAM) skills development, as well as wider changes that are fuelling efforts to decommodify or ‘commonify’ knowledge. Our premise is simple: if public libraries are to endure, we believe they must evolve to become bastions of a 21st-century knowledge commons with an explicit commitment to help build a social knowledge economy. Public libraries in the UK face a number of challenges, including the implications of historic under-investment in capital assets and service modernisation, falling footfall and a general decline in book-borrowing. The rapid growth of the UK’s internet economy and, with that, the significant take-up of e-readers and e-books has undoubtedly played a part in luring more affluent communities away from libraries in recent years. The same could also be said for growing competition from alternative leisure pursuits and, in particular, those facilitated by new technologies. It is, nonetheless, public sector austerity to which most attribute the current crisis in the public library service, as local government is forced to rationalise its capital assets and quickly reduce revenue costs. Efficiency measures have already resulted in local government having to reshape library provision by co-locating a range of services within library buildings, transferring responsibility for 15% of public libraries to communities, reducing the number of mobile libraries, and closing stand-alone library buildings in many places. Moreover, the LGA’s Funding Outlook for Councils from 2010/11 to 2019/20 indicates that the situation will worsen as local authority budgets for cultural services may be reduced by 90% by 2020. This is, however, to overlook a simple and, potentially, inconvenient truth: that the rationale for public libraries in and of themselves continues to lose traction amongst significant user demographics. The situation is, in many respects, unsurprising when we consider the ways in which the copying or replication of knowledge, access to knowledge, search for knowledge, knowledge generation, exchange of knowledge, and trade applications of knowledge have been subject to digital disruption and increasing commodification over the past 25 years. This has been compounded by a lack of general awareness about the limitations and trappings of the technologies supplanting traditional library functions (in particular, online search engines) and also our gridlocked economy and growing concern about the impact of traditional intellectual property upon our socio-economic evolution. This has led many to believe that the information society represents a game-changer and, potentially, sounds a death knell for public libraries—just as video was said to have killed the radio star. By contrast, Common Futures sees real and significant opportunities in recent developments for public libraries, and this is why we have opted to raise awareness and explore the potential for them to embrace the democratisation of publishing and the new technological means of reproduction, such as 3D printers. We believe that such a realisation could free libraries to become hubs for the generation of mutually beneficial knowledge assets with their users and communities, rather than them moving to incorporate the commercial intellectual property expertise and support that would stand in opposition to this. But how do we move from a situation where advocates of public libraries continue to regard them as portals through which to access ‘all the world’s knowledge’ (or at least, its traditional intellectual property), to one where libraries proactively support the expansion of a non-exploitative knowledge commons and, with that, serve as social and cultural levellers into the future? Affiliation or partnership working can enable public libraries to tap into established communities of interest and pool resources and hacker/maker expertise to encourage STEAM skills development. Co-location has the potential to reduce overheads as well as to increase footfall through the establishment of inclusive community workshops. Integration has the potential to evolve libraries in a more fundamental sense than either affiliation or co-location. That is, drawing upon the success of libraries that facilitate self-publishing on the part of the communities they serve, integrated library-hack-makerspaces are designed to invite contributions of knowledge and know-how from library users, eventually building them into what the entire library offers, so as to establish a social knowledge economy through multi-media community publishing. Nonetheless, we believe that the opportunity for transforming public libraries can and should flow from the co-design and co-production of a new model by libraries and contributing users for mutual benefit. And this is why we have sought to support communities to envision the library of the future from the ground-up, linking it to practical prototyping activities in different locations. The ultimate aim is to stimulate and support community publishing, expanding the social knowledge economy so that all of us might benefit from this uniquely abundant commons. To date, our work has involved establishing a prototype in Colchester, Essex, in the form of St Botolph’s Waiting Room. The Waiting Room has transformed a challenging building—an old bus station—into an integrated library-hack-maker space. The project’s mission is to support creativity and mutually beneficial enterprise by uncovering and supporting development of the town’s cultural heritage. As such, the Waiting Room proactively incubates and supports creative start-ups that have included a gallery, history archive, community workshop and bar/café/restaurant—and all on a joint venture basis to aid the project’s sustainability. Initial funding and support for activities associated with the Waiting Room was secured from Arts Council England, the Government’s Portas Pilot scheme, the EU’s CURE Programme, Colchester Borough Council, Locality and the Carnegie UK Trust. Now, however, a healthy independent income is derived from the bar, kitchen, café, community workshop membership fees, short-stop-shop units and resident studio rentals to propel the project towards sustainability in its own right. 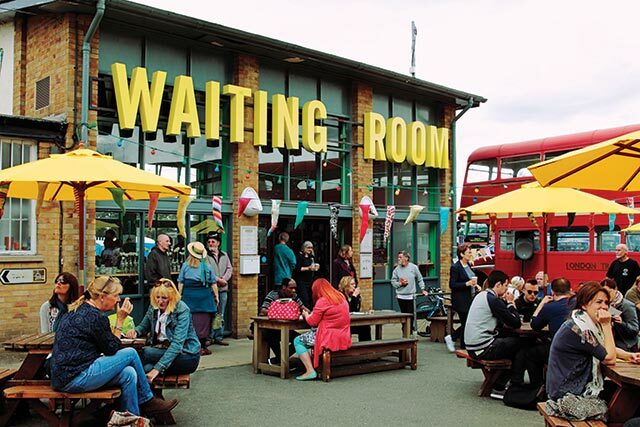 The Waiting Room facilitates the exchange of ideas and promotes lifelong learning through, for example, its give-get library, Maker Wednesdays and Age UK’s Men in Sheds—all of which enable local people to share their knowledge and know-how in a semi-structured yet user-friendly environment. For this reason, the project is properly termed a library-hack-makerspace, even though the library area differs from a conventional public lending library. This approach to the engagement and development of both online and offline communities has contributed significantly to the Waiting Room’s success, to the extent that those involved are determined to build upon the fine grain, the inherent assets, of the creative community in Colchester in the interests of co-producing the project with them. There is, then, no activity or equipment hosted or housed within the space, without there first being an established desire or need and a commitment to help manage it on the part of users. In this important sense, the Waiting Room genuinely seeks to envision the library of the future from the ground up, prototype how that might work with its users, then build upon success as and when it is achieved. Users are encouraged to contribute and exchange as well as consume knowledge and know-how during their use of the Waiting Room. Specifically, a template MakerBox has been developed to encourage creative users of the space to contribute information about themselves, what they’re prepared to offer to other users (and on what basis), their inspiration, their craft, as well as instructions for undertaking a maker project with which they’re particularly familiar. To help develop the give-get library element of the project, each MakerBox contains a related reading list. Whilst the give-get library remains in its infancy, the intention is to develop a library that is complimentary to the more traditional public library service—one that contains local knowledge and know-how within the MakerBoxes. In some instances, creative users are prepared to offer basic MakerBoxes so that others can borrow them at no cost, in keeping with the model of a free public lending library. Others are prepared to offer their time freely or on a barter basis, for example, by facilitating a Maker Wednesday workshop. Where the creative users incorporate the materials needed to run a project outlined in the MakerBox, there are plans to charge users for the purchase of these MakerKits. And where a user would prefer to simply order the finished item, the Waiting Room aims to facilitate peer-to-peer commissioning to extend its business incubation and support offer to creative users in future. Some users who have led Maker Wednesday sessions have also done so as part of testing an enterprise idea. For example, one session led to a designer making a simple computer game console using a Raspberry Pi. He has since prepared a MakerKit for the Waiting Room that contains all the parts, and produced an accompanying booklet of the instructions, based on the session he led, so that the Waiting Room can lend a related MakerBox. In doing all of this, he is eager to test the market for this type of game console kit. This, then, serves to underpin the borrow/barter/buy/bespoke business model upon which the project rests, and points to the way in which an open source business model for public libraries might underpin the expansion of a non-exploitative and generative social knowledge economy in practice. Our experience points to the need to re-envision the library of the future from the ground up, and for library leaders and communities to co-design and produce them for mutual benefit. Looking ahead, we will work with interested parties to prototype and iterate this vision in practical settings—supporting mutual education, brokering relationships, and demonstrating the opportunities and challenges that flow from our Common Libraries approach. The ultimate aim is to stimulate and support community publishing, expanding the social knowledge economy so that all of us might benefit from this uniquely abundant commons. However, in the first instance, the infrastructure upon which public libraries are premised will require some measure of civic re-engineering—from deploying templates and peer production licenses to the evolution of distributed and autonomous human search engines. We will then seek to leverage the networked effect in helping libraries around the world to protect and expand a social knowledge economy for mutual benefit—in contrast with so many contemporary sharing economy platforms. It is for this reason that we aspire to establish one of the world’s first Open Co-ops—so that members and communities, as well as individual (local) libraries and the public institutions that support them can genuinely own, manage and benefit from the conscious contributions they make for themselves and others. Annemarie Naylor is Director at Common Futures and Associate Director with Locality. She recently received an international OuiShare Award for development of the Common Libraries initiative.